One of India's largest and busiest cities. After acclimatising to the heat, the bustle and the jet lag your eyes will be opened to a rich and colourful culture. Mumbai is India's centre of fashion, thus you can find great bargains in the shops and the markets but you will also find fascinating remnants of the British Colonial era. Mumbai, still sometimes known as Bombay, is an eclectic city with a wealth of adventure to offer any traveller – look past the initial aesthetics of the city and into its rich and colourful culture. 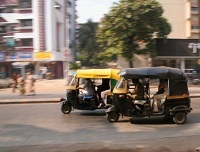 Flights to Mumbai, India operate from most of the UK's main airports with direct flights available on Jet Airways, Air India and British Airways. The prices of flights to Mumbai increase during the holiday season and the Indian religious festivals. Therefore, try to book your cheap flights to Mumbai, India to get the best prices well in advance to visit this enchanting colonial city. Discover India’s rich and vibrant culture which runs deep through the veins of this fascinating country. There is a calendar of events throughout the year and colour plays a huge part in all of these in terms of clothing, food and decorations. Film buffs and lovers of the finer things of life will enjoy the superb entertainment in this commercial capital of India. It’s no surprise that you will find Bollywood here and its international stars as well as world-class restaurants, great bars and fantastic fashion gems to be found in the many boutiques and markets. 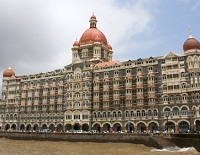 Take a walk down towards the harbour to see the Gateway of India and the beautiful Taj Mahal Hotel, well worth popping in for a traditional British Afternoon Tea. From the launch you can also get into a little boat or even hire a yacht to take you across to the Elephanta Islands and their UNESCO World Heritage site the Elephanta Caves. We recommend making an afternoon of it and then you have the opportunity to wander around the island as well and picnic with the resident monkeys. A fantastic remnant to the British Raj era, much of Mumbai demonstrates just how much of an influence and impact the British had in the architecture of buildings and collections of artefacts in the museums. Use our flight search box to find the cheapest flights to Mumbai, India, we recommend you book in advance and try to avoid the peak seasons and religious festivals in order to find the best deals. As well as assisting you with a great selection of low cost flights, we can also find you the most competitive air fares for lastminute flights. With a tropical climate, Mumbai does generally have a fairly humid climate along with maximum temperatures between 25˚C -35˚C throughout the year. Mumbai is split into 3 seasons; winter (November-February), summer (March-May) and Monsoon Season (June-September).